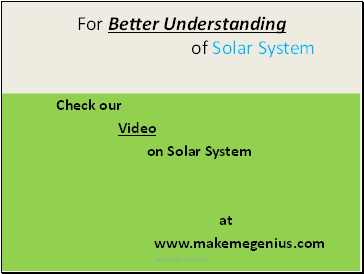 The Sun, its planets and all the objects moving around them collectively are called Solar System. 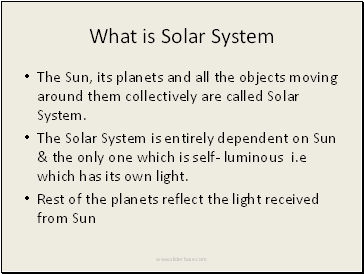 The Solar System is entirely dependent on Sun & the only one which is self- luminous i.e which has its own light. 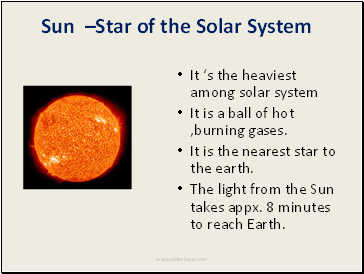 It is a ball of hot ,burning gases. It is the nearest star to the earth. The light from the Sun takes appx. 8 minutes to reach Earth. 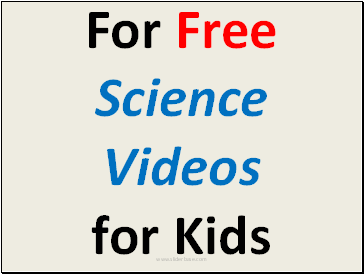 It is the source of all energy for life on Earth. 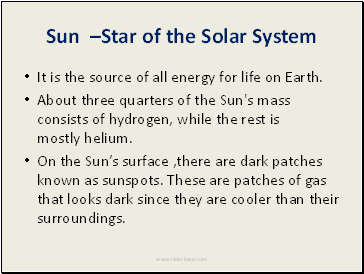 About three quarters of the Sun's mass consists of hydrogen, while the rest is mostly helium. On the Sun’s surface ,there are dark patches known as sunspots. These are patches of gas that looks dark since they are cooler than their surroundings. 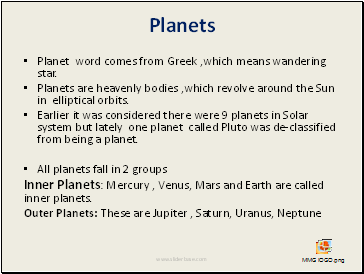 Planet word comes from Greek ,which means wandering star. 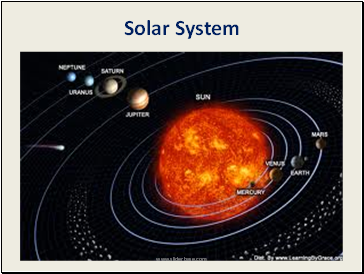 Planets are heavenly bodies ,which revolve around the Sun in elliptical orbits. Earlier it was considered there were 9 planets in Solar system but lately one planet called Pluto was de-classified from being a planet. 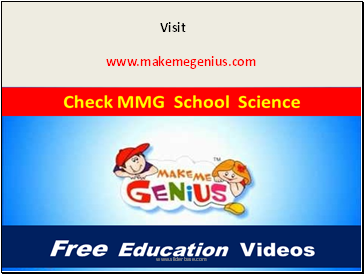 Inner Planets: Mercury , Venus, Mars and Earth are called inner planets.